“I really don’t want you to go on the clay cliffs. The paths are so narrow. What if you fall and slide down?” Mom responded to our eager request to go hiking. “But, mom, you climbed all over the clay cliffs when you were growing up. You’ve told us so many stories. And besides, we know where to go, ’cause we’ve gone on them with you and dad before. We’re not little kids anymore. I’m eight years old!” I announced proudly. “Hooray!” my year-and-a-half younger brother and I shouted. And with that we dashed out the door and across the big wrap-around porch of our grandparents’ house. 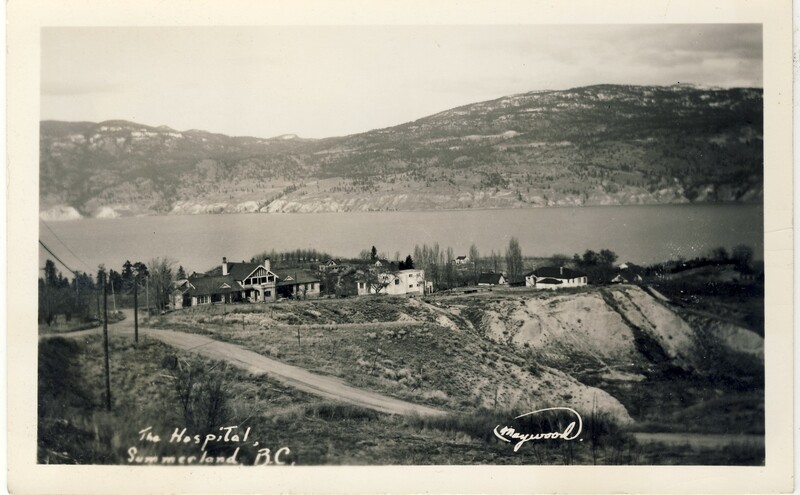 Grandpa and Grandma lived in West Summerland, right across from the old hospital where I had been born on my parents’ summer holidays. Now we took a quick look up and down steep Sully Road and then scampered across. We ran across the hospital lawns, until we came to the edge of the steep clay cliffs. Unlike the irrigated lawns behind us, the clay cliffs were barren but for the scruffy sage bushes and small clumps of stiff grasses that grew wild in this arid climate. Peering over the edge, we gazed down, down, down to where the narrow 2-lane highway wound its way through the bottom of the gully. We skirted along the top edge of the cliffs, looking for the start of the narrow path that clung to the cliff side. No more than a foot wide, it headed in serpentine fashion down toward Okanagan Lake and our beloved Rotary beach far below. Finding the path, my brother shouted, “Come on! Let’s go!” I hung back for a moment, suddenly a little nervous. But then I took a deep breath, and started down the path. As we descended, birds swooped over our heads. It looked as if they would smash into the cliff side, but at the last moment, a little dip or lift, a folding of wings, and they would touch lightly down on the edges of small dark holes, and then disappear inside. Small peeps welcomed them to their nests. Here and there, initials were carved into the cliffs. Some were fresh and clear; others were worn away almost to the point of disappearing completely, witness to past generations of young lovers. About halfway down toward the lake, our path forked. The right hand fork lead on down to where the beautiful clear blue waters of Okanagan Lake beckoned. I imagined the sand sliding between my toes and the freshness of the water cooling my skin, which by now was already becoming dusty and dry. Reluctantly, though, I turned and took the left fork, which led upwards back toward the top of the cliff. Mom had told us not to go too far, or be gone too long, and I was an obedient child. Going downhill had been easy, but trudging up this steep path with dust swirling up from our feet and rubbing blisters between our flip-flop clad toes, was not quite so much fun. The famous Okanagan sun was pouring its rays down on us from the clear skies, and by the time we reached the top, my hair was clinging damply to my forehead and neck. We gratefully stepped into the shade of the fruit trees in the orchard at the top of the cliff, and flung ourselves down into the long soft green grass. Looking around, we saw that not far away sprinklers were whirring cool sprays of water over a large garden, and out onto the dirt road beside it. We joyfully jumped to our feet, and ran down the tractor path and through the sprinkler. It felt wonderful! Cooled down now, we followed the track out to Sully Road. Trudging slowly up the steep road, we arrived back at our grandparents’ home. Mom was sitting on a blanket in the shade of the walnut tree, with my baby brother toddling around in the grass. Dad was sitting on an old chaise up on the ivy-covered porch, reading the newspaper. And there was Grandma sitting on the front steps of the porch, with the lap of her wrap-around apron full of peas fresh picked from the garden. She had a big bowl beside her. Forgetting our tiredness, we ran across the front yard, and sat down one on each side of her, eager to help shuck the peas.